Shockwave therapy involves using compressed air to fire a pellet back and forth within an applicator that looks like a wand or gun. The energy created is transferred through the end of the applicator and into the tissue to promote reparative processes. Shockwave can help treat bones, tendons and muscles. It is most commonly used to reduce pain and improve mobility. More shockwave therapy information here. Shockwave therapy helps to stimulate new blood vessel formation, helps to reverse chronic inflammation, stimulates collagen production, helps to break up calcified tissue (like in calcific tendonosis), disperses pain mediators (chemicals around an injury that make us feel pain) and can help to release tight muscles. Shockwave therapy has been shown to accelerate the healing process by increasing blood flow to the affected area, and boosting metabolism to help repair tissue in the affected area! Shockwave is an especially good option for chronic issues (issues that have been lingering for longer than 3 months). Shockwave Therapy can be used to treat a variety of painful disorders. 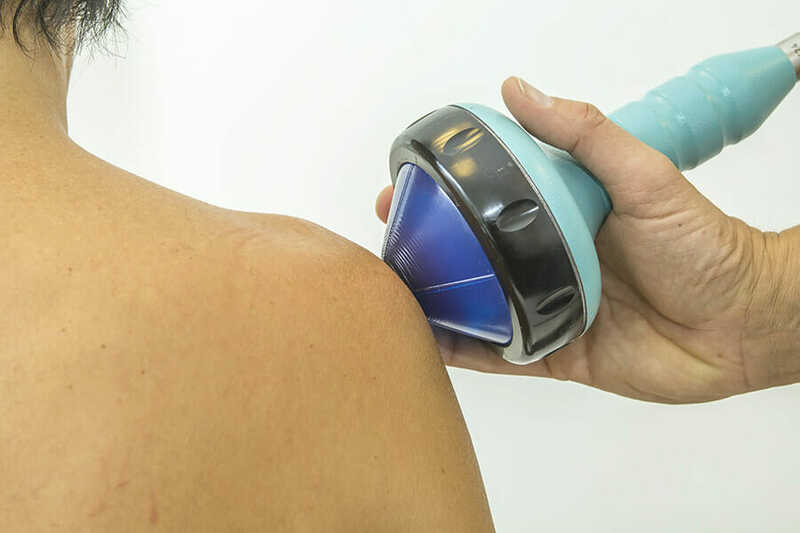 At Nottinghill Family Wellness Centre our best results with Shockwave Therapy have come with a combination of Muscle Release Therapy and IFC (Interferential Current Therapy). Extracorpeal Shockwave therapy is used to alleviate pain, increase blood flow, break up scar tissue and relax the muscles. Shockwave therapy is an aggressive treatment, and is therefore a little bit uncomfortable. It is very effective, so our patients think that the discomfort during treatment is worthwhile! There are no serious side effects from shockwave therapy. There may be some temporary skin reddening or discomfort for an 1-2 following treatment. How Much Does Shockwave Therapy Cost? At Nottinghill Family Wellness Centre we don’t believe in charging extra for shockwave therapy, so it is included in the cost of your regular chiropractic visit! If you would like to seek professional help or see if Shockwave Therapy in Oakville will work for you, please contact our chiropractic clinic in Oakville directly at 905-827-4197.